I've already mentioned cookbook and food writers Julee Rosso & Sheila Lukins twice and here they appear again. For me personally as for many others, they were an important inspiration in my early cooking. 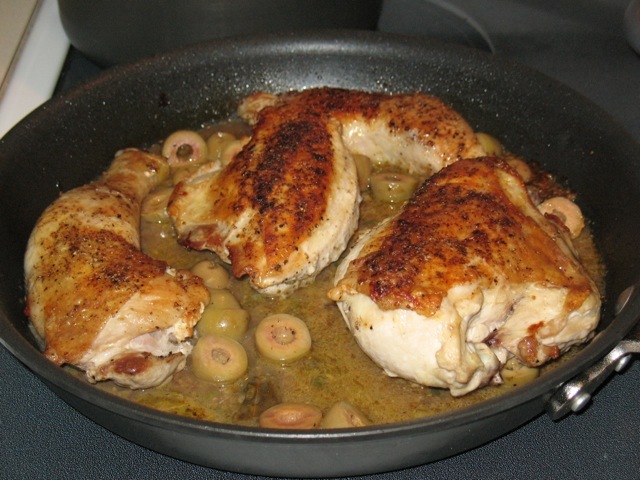 Chicken Marbella is probably their most famous recipe. According to its introduction in The Silver Palate Cookbook, it was the first main-course entree served in their Manhattan food shop, The Silver Palate. When I was young, my mom made this sometimes when we had dinner guests, and I always really liked it. 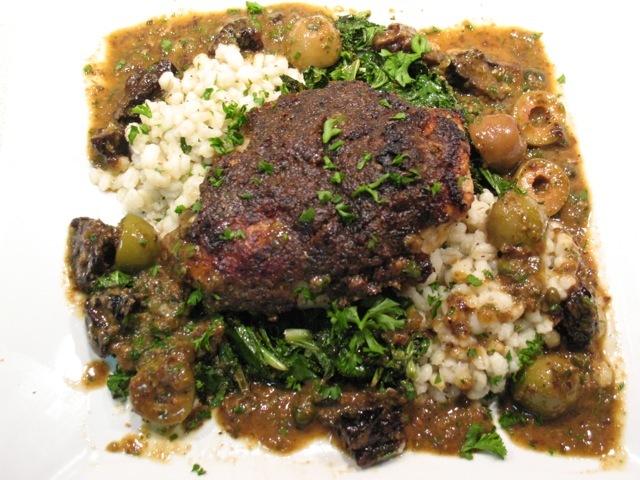 The best part is the sauce, a savory-sweet composition white wine, brown sugar, olives, vinegar, prunes and herbs. I made it myself when we entertained some friends recently, and it's still a crowd-pleaser. This month's issue of Cook's Illustrated pays homage to the dish while offering an updated version. Writer Dan Souza identified three issues with the original recipe that he thought were ripe for updating: the plain chicken skin, bland meat and an overly sweet, lackluster sauce. I take issue with him calling the sauce "lackluster," however, I was intrigued by his attempt to re-create one of my favorite dishes. To address these issues, he made two major modifications. 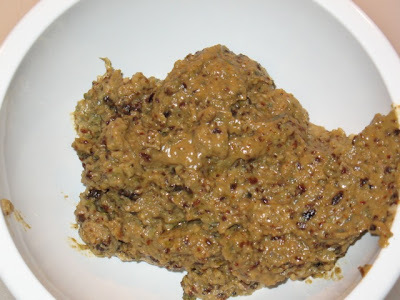 The first was to ditch the marinade in favor of a flavorful paste that is used in part to form the basis of the sauce but more importantly as layer of flavor slathered on top of the chicken. 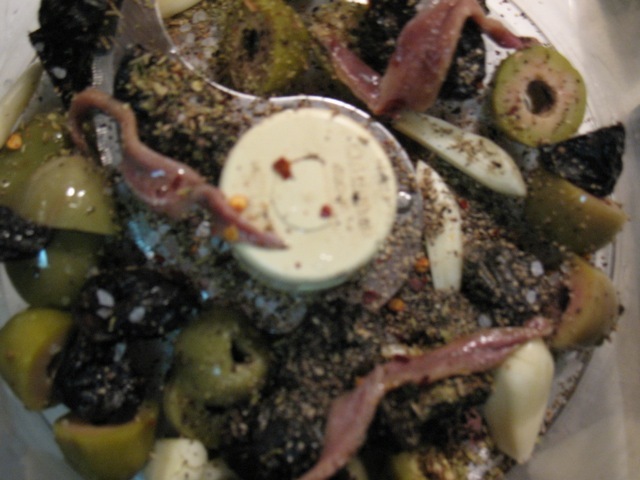 In addition to the green olives, prunes, capers, garlic and oregano of the original recipe, he added some anchovy fillets for depth and red pepper flakes for heat. When blended in a food processor, it's not much to look at (see below). But trust me, it was really good and doesn't look so bad once it's darkened from roasting on the chicken (see top photo above). His other major modification was to brown the chicken skin. 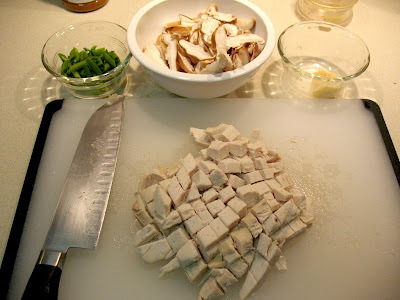 This was a really great idea, for browned chicken skin adds a wonderful flavor to the dish that was missing before. For sides, I made the flash-cooked kale from Mark Bittman's app I raved about recently and a simple barley salad dressed with lemon and parsley. The updated Marbella was definitely tasty, and I agree Souza was able to improve the flavors. It was a lot more work though. One of the nice things about the original dish is that you just toss a bunch of ingredients together to marinate the chicken and then pop it in the oven with a few more ingredients. When I make this again, I might attempt a sort of hybrid between the two where I brown the chicken skin but keep the sauce from the original recipe. Sounds like a good experiment! 1. Boil 4 cups water in a large sauce pan. Add barley, cover and reduce heat to low. Cook barley about 45-50 minutes. Drain barley and put in a large bowl. Combine with olive oil, lemon juice, parsley and garlic. Season with salt and pepper to taste. Yesterday afternoon, I decided to make clarified butter, just to have it on hand. I'd never done it before and it was an interesting process. 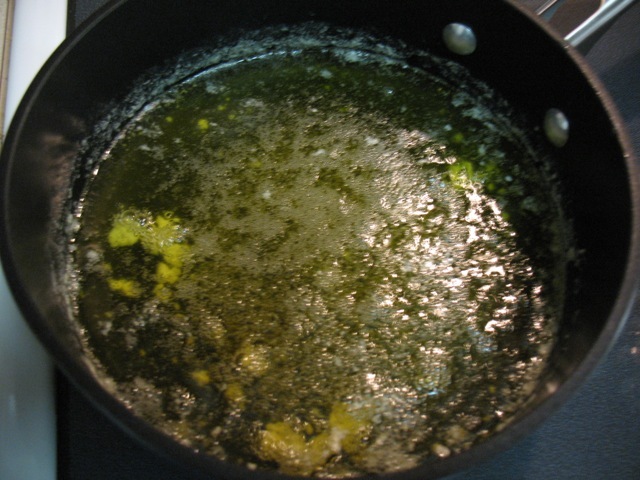 Clarified butter is useful for sautéing at high temperatures. 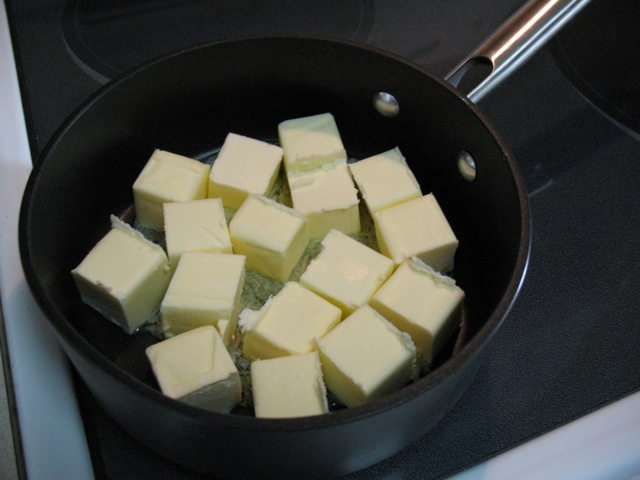 Because butter is a dairy product, it contains solids that can burn, creating a bitter taste (these same solids, when cooked but not burned, create the nutty taste of browned butter). Clarified butter removes those solids, leaving only the oily component of butter. Thus, it is less flavorful than actual butter, but still butter-flavored. Let's clarify something first (that won't get old), ghee and clarified butter are not the same thing. Ghee is a type of clarified butter common in India. 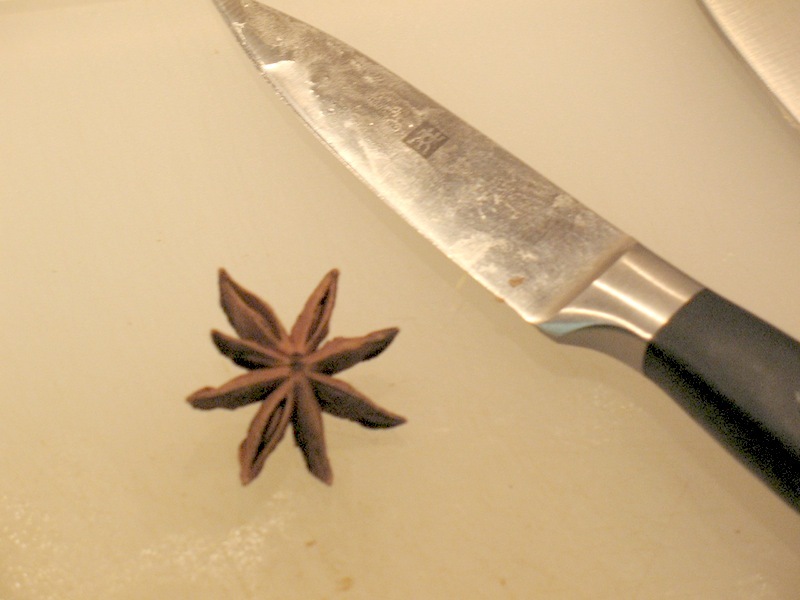 It has a more concentrated flavor, since it is cooked longer, and is sometimes even herbed. Since it keeps well for months, I decided to use a whole pound of butter. I put four cubes in a shallow saucepan over medium-low heat. Gradually the butter melted and then began to bubble, with foam rising to the top, which I skimmed off. You can see in the picture above how even as the butter begins to clear you can see the layer of dairy solids and water as a layer on the bottom of the pan. Eventually, much of the moisture bubbles to the surface, but the solids remain on the bottom to be strained out. Eventually, the foaming subsided, with some of the dairy solids clinging to the bottom of the pan. 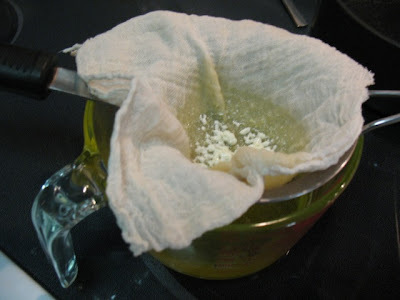 By filtering the butter with several layers of cheesecloth over a strainer, I separated the solids from the golden oily product that was the goal of exercise. The clarified butter solidified in the refrigerator, waiting for me to use it. Now I just need to find some dishes to use it in. Omelets are a satisfying and versatile breakfast food that can be as simple as just eggs or as complicated as you want, providing a foundation for innumerable combinations of vegetables, herbs, meats and cheeses. With this step-by-step guide, I'm seeking to make omelets as foolproof as possible. Omelets can also be a bit scary. For many home cooks, what begins as an omelet often ends as a scramble. Tasty for sure, but not the desired finished product. Many experts have weighed in on omelet-making, and while the techniques from chefs like Julia Child and Jacques Pépin are interesting, they aren't simple to master. All that shaking and tapping probably gets you perfect results, but my simpler method, while not perfect, does a satisfying job with more ease. 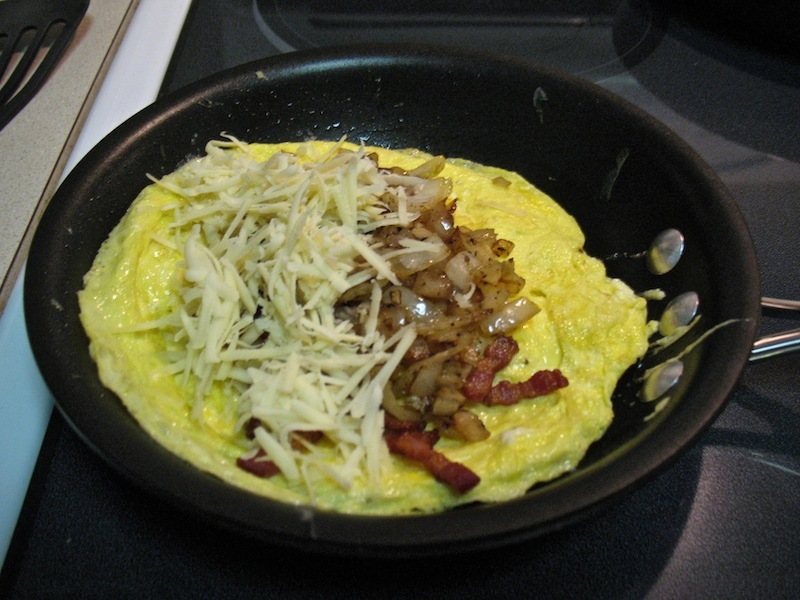 For this example, I made a simple omelet of bacon, sautéed onion and cheddar cheese. 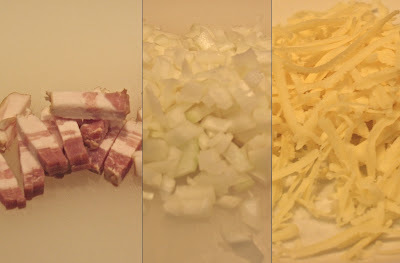 I sliced two strips of bacon into lardons (i.e. little strips about 1/4- to 1/2-inch wide), diced a small yellow onion and shredded and 1/2 cup of cheddar cheese with the larger shredder. Using a 10-inch nonstick frying pan, I browned the bacon, set aside the cooked bacon and removed most of the bacon fat from the pan and then sautéed the onion with seasoned salt and fresh-ground black pepper (you could also completely drain off the bacon fat and sauté the onion in olive oil, if you prefer). 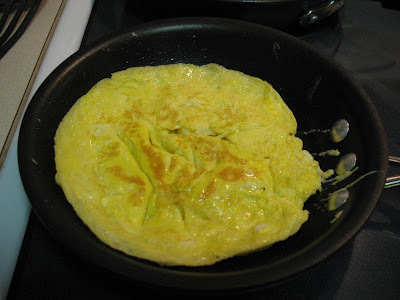 For making an individual, two-egg omelet, an 8-inch nonstick frying pan works best. A larger pan will spread the egg out more, making it thinner and thus more difficult to handle. I begin by heating the pan over medium heat with 2 teaspoons of extra-virgin olive oil, which should be enough to coat the bottom of the pan. I beat 2 eggs in a 1-cup glass measuring cup using a fork (about 70 beats). 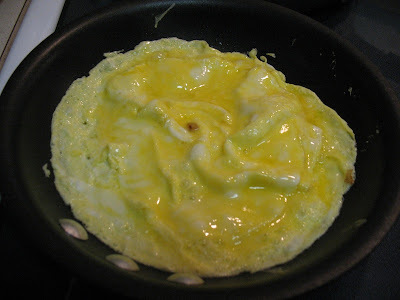 If you're making multiple omelets, you could beat all the eggs together and portion them out into the pan, but I wouldn't recommend it. It's simpler to go two eggs at a time. 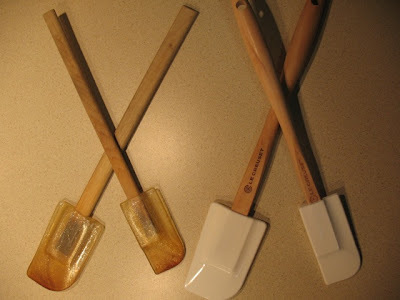 The eggs will cook quickly, so be sure to have all your equipment ready before you start (the spatula, the larger wedge spatula and the plate). Pour the eggs into the center of the hot oil in the pan. Don't pour the eggs into the frying pan until it's hot. When the air above the pan feels hot and the oil swirls around the pan as easily as water, you know it's ready. 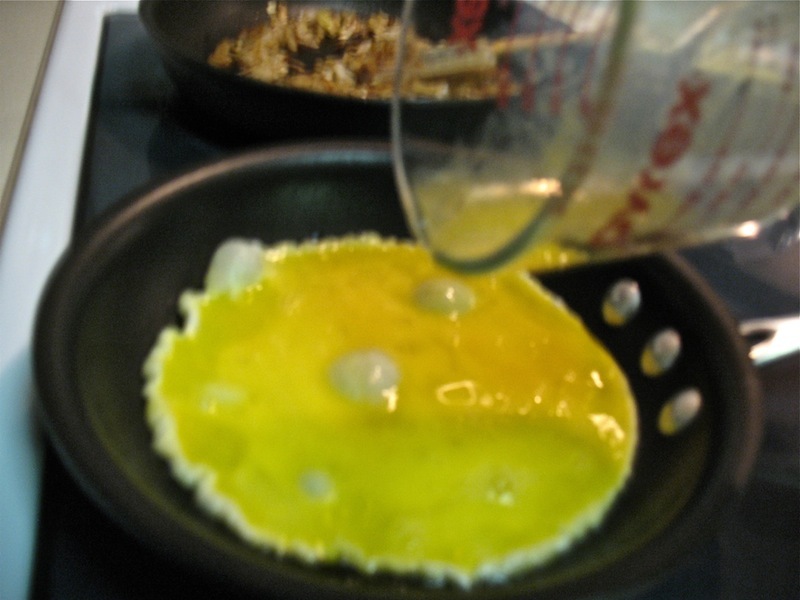 Putting the eggs in too soon will make it soak up more oil and possibly stick to the pan. If you're too hesitant to try the flip, there are alternatives. First, you don't need to flip at all if you like (or don't mind) a slightly uncooked center. It't not my thing though. Second, you can use the broiler, which I did for many years. While you're preparing the fillings and starting the eggs, heat the oven broiler with the rack in the highest position (about 3-4" from the broiler). After the step to lift the cooked omelet and allow the runny parts to set under it, put the frying pan in the oven under the hot broiler to set the top. Watch it carefully--too long under there and it will puff up like a frittata. Like the failed omelet that becomes a scramble, this isn't a taste issue so much as not the desired product. 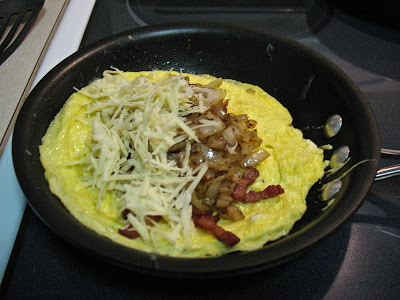 After flipping (or broiling) the omelet, add the fillings. Be sure not to overfill it. 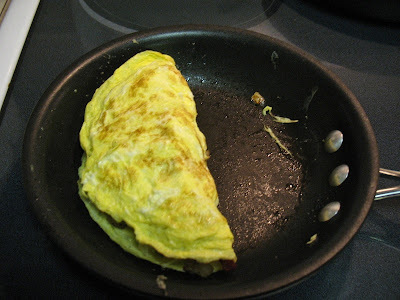 It helps to put the filling more on one side of the omelet, which makes it easier to fold the other side over it. 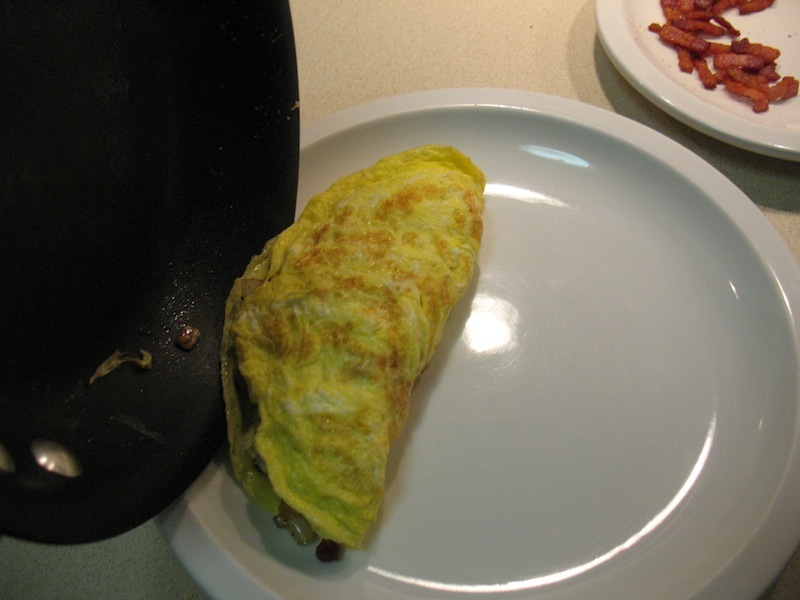 Using a wedge spatula, fold the omelet in half over the fillings. 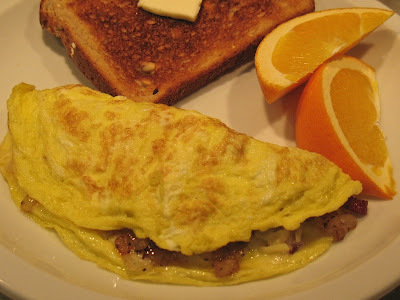 Then, using that same spatula, slide the omelet onto the plate. Voila! A tasty omelet that can be served by itself or with toast, fruit, potatoes, etc. To make another omelet, repeat the process, adding another teaspoon of olive oil in step 1. Caramelized onion, thyme and gruyere. Asparagus, onion and goat cheese. Tomato, fresh mozzarella and basil (i.e. Caprese omelet). Chicken or steak fajitas (great use for Tex-Mex leftovers). Food (Section) Fight is my weekly look at The Washington Post's Food section and The New York Times' Dining section with my verdict on which section had the better content for the week. This week wasn't very close, I have to say. The Washington Post led with Tim Carman's story about how the art of sushi in the United States is doomed. It's a well-researched story with perspectives from local chef Kaz Okochi of Kaz Sushi Bistro. The thing is though, that I'm not a sushi-lover. So this didn't interest me that much. Neither did the other front-page stories about Chinese chef Peter Chang and his pairing Virginia wines with a Chinese New Year's feast nor the article about indoor food smoking (I live in a high-rise apartment building; no way I'll be attempting that). The recipes this week didn't excite me either, except for the Slow-Cooker Spicy Curried Pork that accompanied Bonnie Benwick's article about a cookbook of slow-cooked French dishes. The New York Times, on the other hand, had quite a few interesting things. Their cover story smartly taps into our nation's current heightened interest in Mormonism by exploring how younger Mormons are putting interesting spins on traditionally bland Mormon dishes. The potato gratin on the cover looks quite inviting (it's name, "funeral potatoes" is a little off-putting, although apparently it's not eaten at just funerals). The restaurant articles on the front cover didn't interest me, but I was intrigued by the page 5 story about how Lady Gaga's parents are opening a restaurant on the Upper West Side. The Deviled Crab Meat and Chicory Salad with Egg Dressing, although not something I plan to make, did make me think about doing something with endive and radicchio soon. And finally, I enjoyed the article about natural wines and the ensuing controversy around them. Verdict: For the third straight week, the winner is The New York Times. This salad was doomed from the start. First, I wasn't able to get all of the ingredients I'd intended to use. Giant and Whole Foods were both sold out of arugula, so I decided to substitute spinach. I wanted to include radicchio, both for color and its bitter taste. I couldn't find that either, so I decided to use radishes instead, which also have a bitter/spicy flavor, although less pronounced. Sometimes, substitutions like this can lead to something exciting and unexpected. Unfortunately for this salad, it just led to something less flavorful. Peeling grapefruit is a chore, as its pith and inner membranes are notoriously difficult to separate. 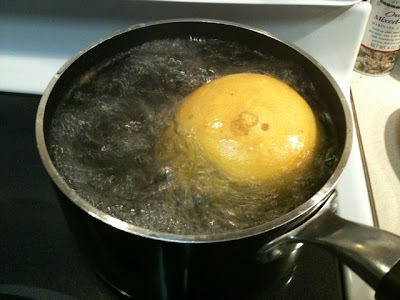 I'd read about a technique to boil the grapefruit first for about five minutes, which causes the pith to expand and separate, making peeling much easier. Indeed, doing so did make the grapefruit easier to peel and I ended up with lovely pink sections free of bitter pith. Unfortunately, I also ended up with a residue in my nonstick saucepan that will not come off. Great. In the end, the salad looked nice, but was lacking in flavor. Once dressed with a lemon-ginger olive oil dressing, it just seemed really too soggy and kind of bland. Not even the bacon could save it. 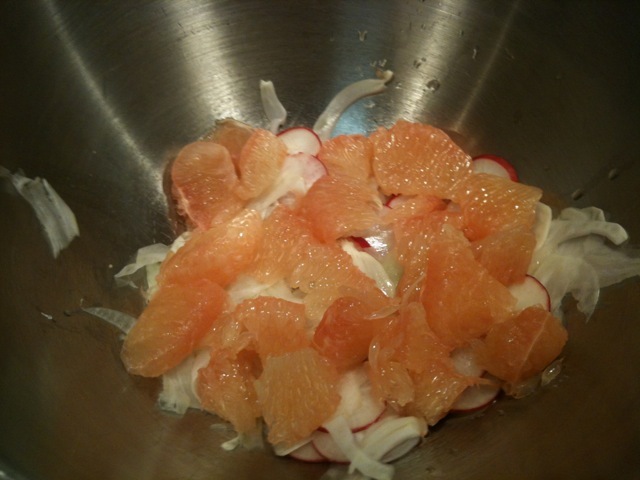 I'd made a salad before with grapefruit, radicchio and endive that was really good. This, unfortunately, was not. This salad, on the other hand, was quite tasty. Having learned my lesson from the previous week, I was not going to attempt another creative salad unless I could find arugula, which thankfully Giant had this week (and it was a nice peppery batch). 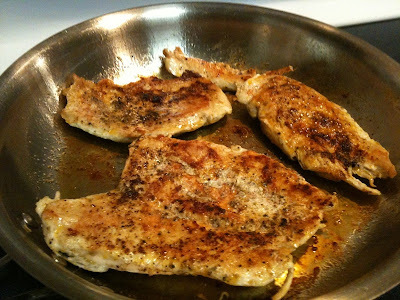 I dredged chicken cutlets in flour mixed with seasoned salt and pepper and sautéed them in olive oil. The flour dredge gives the outside a slight crispness and helps seal in moisture. 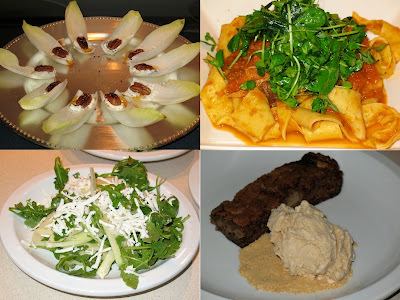 I shaved the fennel and sliced the radishes with my mandolin like the week prior, although this time I added calimyrna figs for sweetness, which also added some crunch due to their seeds. 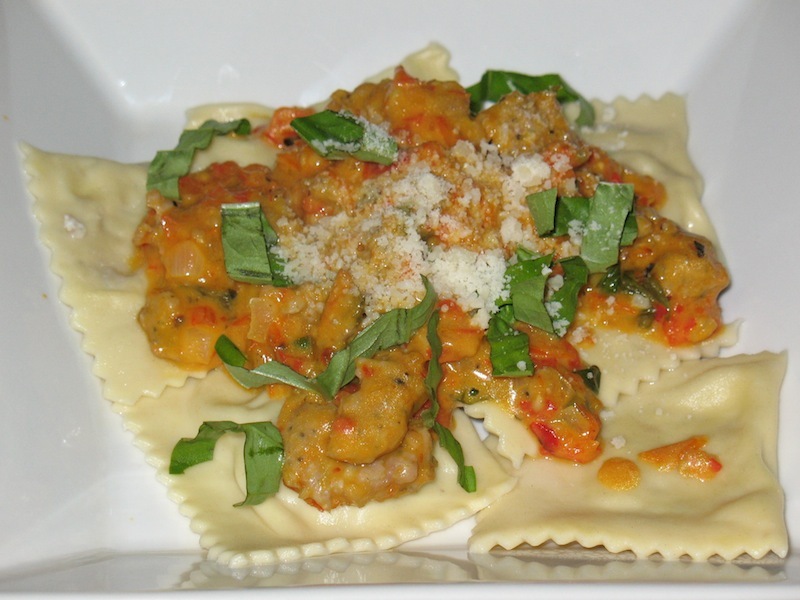 I also tossed in some toasted chopped walnuts, which added rich, nutty flavor. For the dressing, I went with an old stand-by: standard balsamic vinaigrette, for which I combined extra-virgin olive oil, Dijon mustard, honey, balsamic vinegar, a little sea salt and fresh-ground black pepper. The results were a marked improvement from last week's salad. Quite tasty. 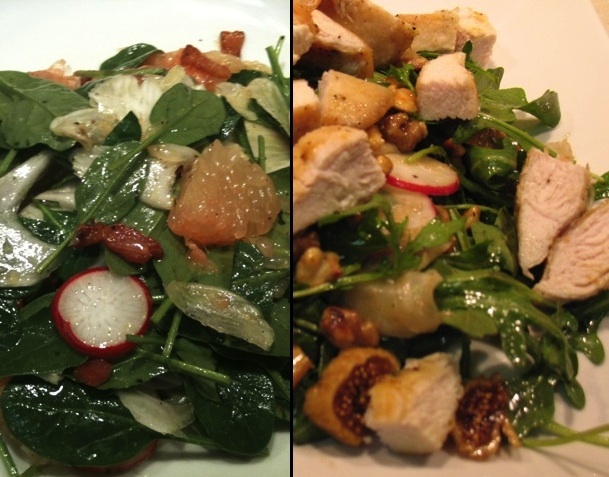 The figs and walnuts went together great with the other ingredients and the dressing pulled it all together. Hooray. 1. 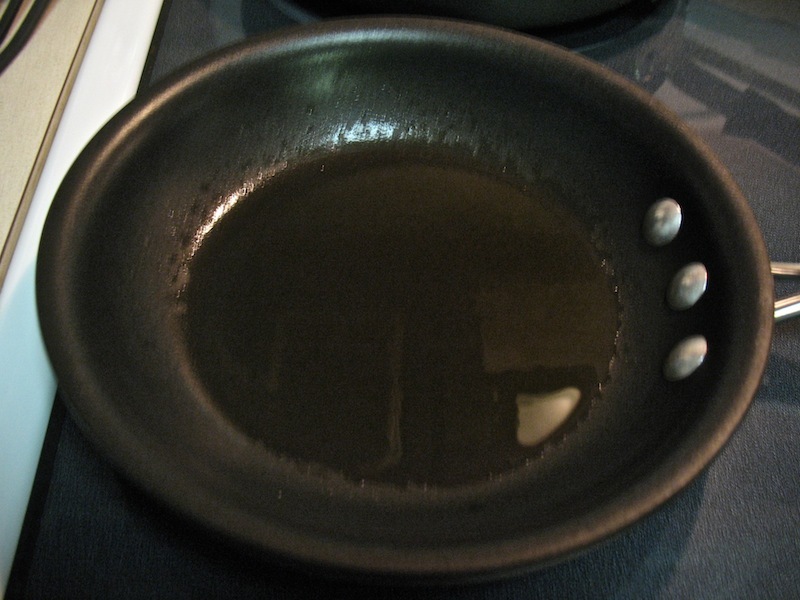 Heat olive oil in a medium-size frying pan over medium heat. 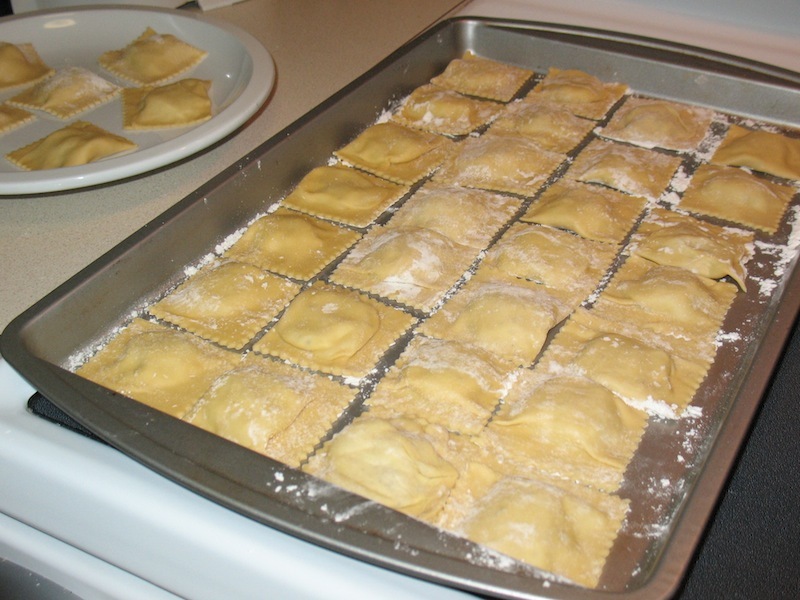 Combine flour, seasoned salt and pepper with a fork on a small plate. 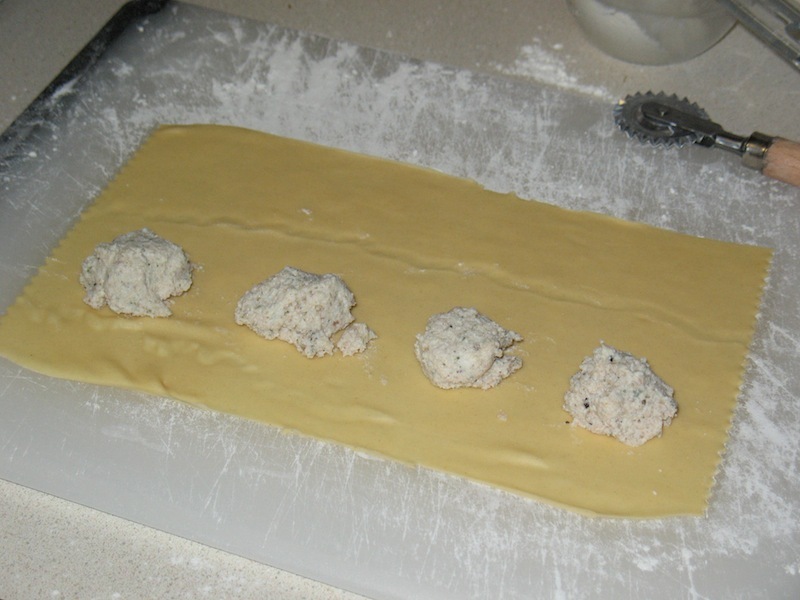 Pat chicken dry with paper towels and dredge in the flour mixture. Add to frying pan once oil is hot and sauté until browned, about 5 minutes on each side. Set aside to cool before cutting up. 2. Whisk together dressing ingredients until well combined. 3. 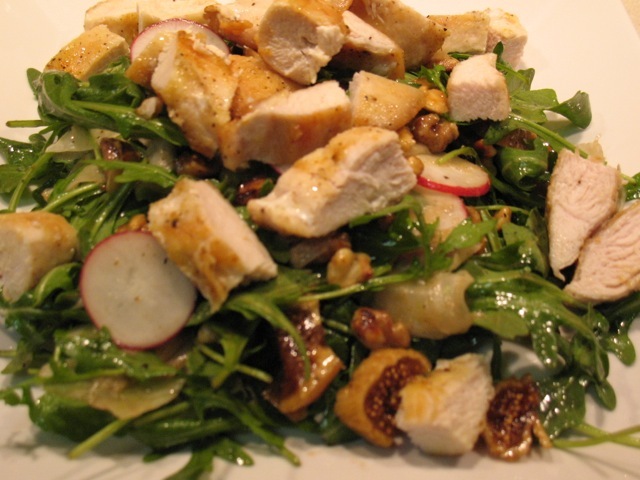 Combine arugula, fennel, radishes, figs and walnuts in a large salad bowl. Toss with dressing. Cut up cooked chicken cutlets and serve salad on plates topped with chicken. I've long been a fan of Mark Bittman's The Minimalist column for The New York Times (just now getting the URL for the link in this sentence and I'm already thinking about when I can try this). The column celebrates simple dishes made really well. What's not to like in that? I had been eyeing his How to Cook Everything cookbook (which has been on my Amazon wishlist since before Christmas), when I noticed that there's a How to Cook Everything app for iPhone. At just $5, it's a real deal, given that the book itself is $35 retail--even with Amazon's deep discount, the app is still way cheaper. Reportedly, the app contains all the book's recipes, plus you get other interactive functionality, like the ability to mark favorite recipes, add your own notes and even make shopping lists. The app is great for browsing recipes, but a bit clunky to use as a reference while actually cooking, since the iPhone is apt to go dark and you have to swipe between steps. Although the iPad version apparently addresses this by allowing you to toggle off the go-dark feature, a good iPhone workaround is to just email the recipe to yourself (the app has a button for doing this) and then print it out or use a computer for reference. A nice advantage of doing this is having all the steps on one screen. If you want a second opinion on why this is so great, check out CNET's review from today. I'm giving Twitter a try, but I don't have any followers yet. Follow me to get updates on blog posts. 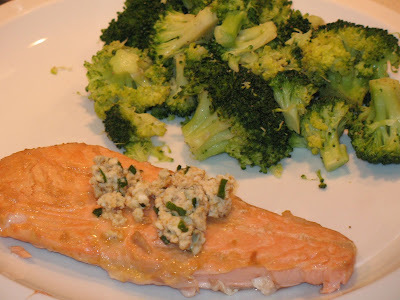 Monday night is fish night and usually that's salmon broiled with a topping of minced garlic, chopped rosemary, lemon juice, olive oil, salt and pepper. Although I return to this combination again and again because it's simple, quick and tasty, sometimes I like to try something different. 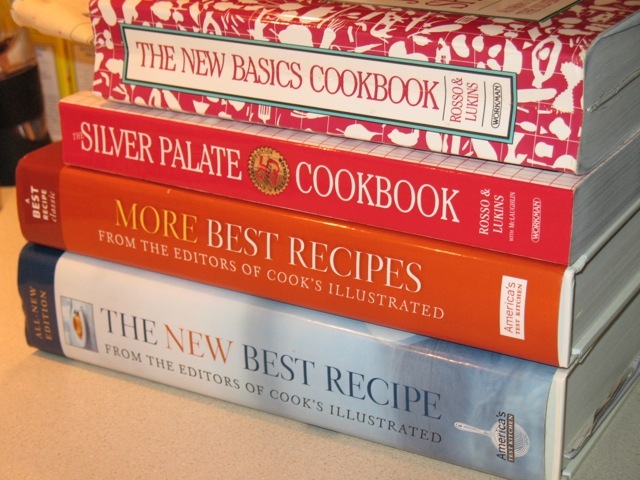 I consulted four of my best go-to cookbooks for some new inspiration. I started by going through Julee Rosso & Sheila Lukins' classics, The New Basics Cookbook and The Silver Palate Cookbook. The Silver Palate doesn't have many salmon recipes, but The New Basics' Salmon with Sesame Butter caught my eye, as I was thinking something with some Asian flair could be good. From the Cooks' Illustrated folks, I thumbed through their encyclopedic The New Best Recipe and More Best Recipes. 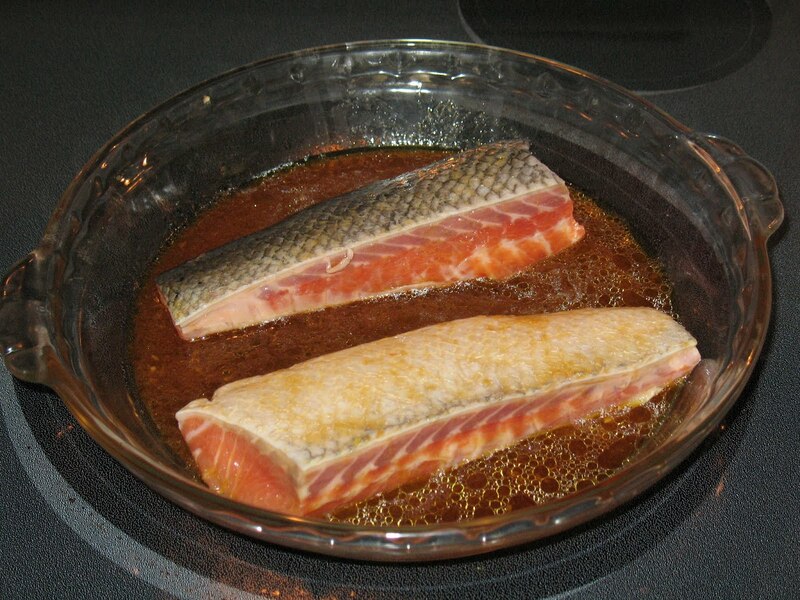 I was intrigued by More Best Recipes' Poached Salmon with Bourbon and Maple Syrup, although I did't have shallots or chives on hand, so I decided to save it for another time. From the New Best Recipe, I spotted Grilled Salmon with Sesame-Soy Glaze, which was similar to the recipe I liked in The New Basics, however it included an extra ingredient I decided would be essential to my fish dish: fresh ginger. So the winner is The New Basics' Salmon with Sesame Butter, albeit with some tweaks. I decided that I wanted to bake the salmon, rather than broil it. Since I didn't have time to marinate it for a full hour, I thought this would allow more of the delicious flavors of the marinade to end up in the final product. I mixed up the marinade, adding 2 teaspoons of minced ginger. I also swapped out the vegetable oil for extra-virgin oil because I like it better and it has more flavor. 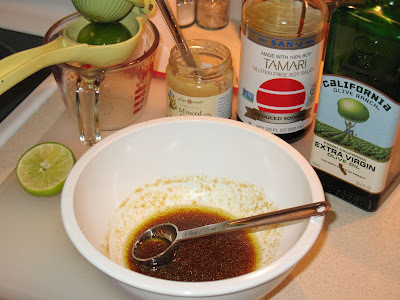 For extra flavor, I use tamari, a more concentrated type of soy sauce. I marinated the salmon in a pie plate, which was ideal as a shallow vessel for the marinating and could also go in the oven for baking (note: the salmon is not cooking on the stove, it's just sitting there before going in the oven). 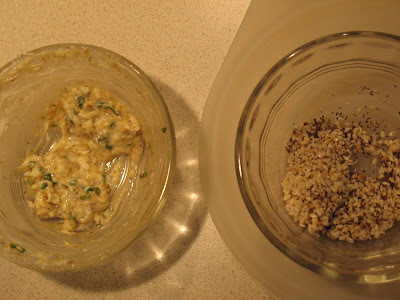 I toasted the sesame and celery seeds in the oven as suggested, then mixed them into the butter mixture, which I then put in the freezer for a little bit to harden. The New Basics recipe used a full stick of butter, which is way too much for two people, so I cut down to use just 1 tablespoon of butter, which, when combined with the other ingredients, made just enough for the two fillets. Since the seeds toasted at 350 F degrees, I decided to roast the salmon at that temperature too. After 20 minutes, I checked the salmon's internal temperature, which was exactly 140 F. Perfect. 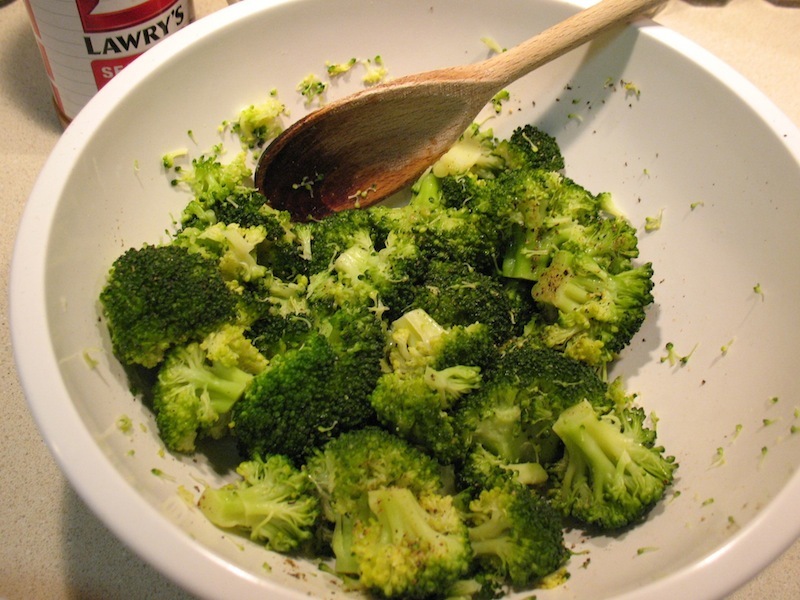 For a side, I steamed two crowns worth of broccoli florets, which I sprayed with some extra-virgin olive oil and sprinkled with seasoned salt and fresh-ground black pepper. As an alternative to our usual broiled salmon, the baked salmon was quite tasty. It had a nicer texture and the sesame butter was a nice topping. Although the longer cooking time won't cause me to permanently switch from broiling fish, I'll keep this in mind for Mondays when I have a little extra time. 1. Combine the marinade ingredients in a shallow oven-proof dish. Add the salmon, turn to coat, and marinate skin-side up for about 30 minutes. 2. Preheat the oven to 350 F. Put the sesame and celery seeds in a small ramekin and toast in the hot oven for 3-5 minutes, checking after 3 minutes to see if the seeds are fragrant and lightly browned. Remove from the oven and set aside to cool. 3. Bake salmon for about 20 minutes until the internal temperature reads 140 F on an instant-read thermometer (this is pretty well-done for salmon, which is how we like it; for rarer fish, reduce cooking time). 4. While salmon is baking, mix up the ginger-sesame butter by combining the toasted seeds with the remaining ingredients. Place in the freezer for about 5 minutes to firm up. 5. When salmon is done, remove and discard skin. Serve topped with ginger-sesame butter. If Columbia Heights proper has been taken over by corporate chains, one need not venture far for some authenticity. About two blocks northeast from the Metro station, RedRocks Firebrick Pizzeria occupies a corner rowhouse with two levels of dining plus a first-floor bar. The exposed brick interior is instantly inviting and the owners have made good use of the small space by putting mostly smaller parties downstairs with larger tables upstairs. Of course the pizza is what you care about, and it's pretty great. On a recent Friday night, I had the RedRocks Sausage, a spicy pie with tomato sauce, fontina cheese and sweet and hot peppers. To help tame the spice I added caramelized onions. Chris has the Salsiccia, a similar, less fiery pie with sausage, fresh mozzarella, olives and tomato sauce, plus the caramelized onions he also customized (can't resist those onions). Both pizzas were quite good, as was the Flying Dog Snake Dog IPA on tap. A few years ago, upscale pizza was a market dominated by 2 Amys and, to a somewhat lesser extent, Pizzeria Paradiso. Now, thankfully, there are lots of options around town. And with 2 Amys so difficult to get into, I'm pleased to count RedRocks as one of my favorites. The Jan/Feb 2012 issue of Cooking Light has a tasty-looking feature on international soups. I was initially interested in the Spicy Thai Coconut Soup (a.k.a. Tom Kha Gai), but found a recipe elsewhere that doesn't include sambal oelek. The Greek Avgolemono sounds tasty, as does the German Chicken Soup with Cabbage and Apple. In the end, possibly in anticipation of the new noodle bars coming soon to Penn Quarter, I settled for the Japanese selection, Chicken-Udon Soup. Since I've never made this before, I adhered pretty close to the printed recipe. I didn't substitute any ingredients, although I did perform a couple steps in different ways. I had to buy star anise for this, which is a beautiful spice that lives up to its name. I shot it by a paring knife so you can get a sense of its size. The recipe calls for 2 cups shredded cooked chicken breast, but doesn't offer any hints about the best way to cook it. So I did it in the microwave and cubed the chicken, rather than shredded it. Since it's going in a soup, it doesn't really matter and this worked fine. 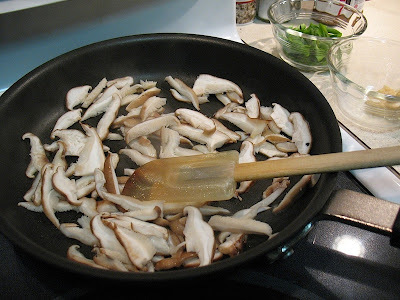 Second, to avoid dirtying multiple large saucepans, I did step 3 with a medium-size frying pan while simultaneously reheating the flavored stock from step 1 in the first large saucepan and then adding the mushrooms to the stock once they were done cooking in the wine. The broth was quite tasty, as were the shiitake mushrooms. 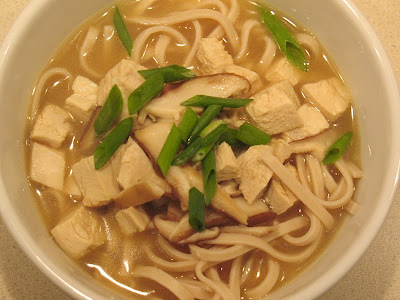 My only gripe with this dish, which I should have remembered from previous udon soup experiences, is that it's hard to eat unless you have chopsticks. You can use a fork to twirl the noodles, but then you're not getting any broth. You can use a big spoon, but the noodles won't stay on it. Needless to say, eating udon is a little messy; have napkins ready. This was one of two cocktails I made up for last New Year's Eve and the better of the two. 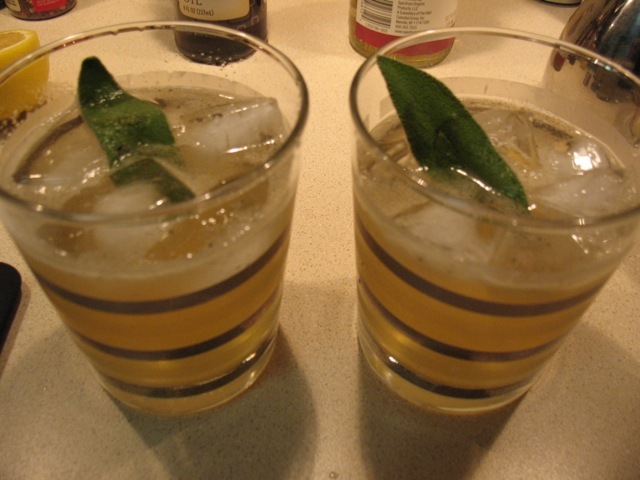 It's like a dark n' stormy dressed up with the citrus-vanilla flavor of Licor 43. Combine rum, licor 43, lemon juice and bitter in a shaker with ice; shake until cold. Divide between two rocks glasses filled halfway with ice. Top each drink with about 3 oz. ginger beer. Food (Section) Fight is my weekly look at The Washington Post's Food section and The New York Times' Dining section with my verdict on which section comes out on top for the week. This week's food sections did a good job of answering some things I've been wondering about lately. Last week, I posted about my surprise to find that one of my breakfast oranges was a cara cara orange, a red-fleshed navel orange that looks like a small grapefruit but tastes like any other orange. My friend insisted it was the same thing as a blood orange, but actually, they are two different varieties as this week's Washington Post Food section cover story makes clear. 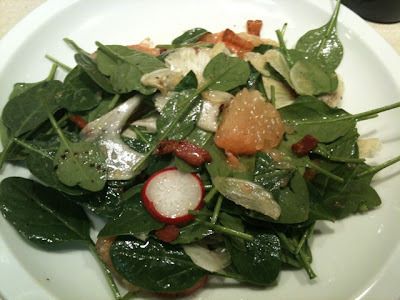 With the story was a recipe for a Pomelo, Escarole and Candied Bacon Salad with Meyer Lemon Dressing that sounds interesting and not that different from a salad I made last night with spinach, fennel, grapefruit, bacon and lemon-ginger dressing. I also enjoyed The Post's article about how newspapers test recipes, which I feel is very important. I think any recipe a cookbook, newspaper or other food publication puts forth should be tested to ensure the ingredient amounts are correct, the steps are logical and the dish works well as a whole. The writer has a responsibility to do so, and I'm glad to hear The Washington Post, along with the Los Angeles Times, San Francisco Chronicle and the Associated Press, all agree. The New York Times though gets a gold star for exploring something I've really been interested in: the practicality of the book Modernist Cuisine: The Art and Science of Cooking. This six-volume, 2,400 page set was last year's most-talked-about but probably least purchased cookbook (it retails for $625). Employing scientific principles, the book looks to invent new cooking methods to achieve perfect results. Practical for the home kitchen this is not, but Times writer Melissa Clark took on the challenge to see whether there were recipes--sans ingredients like liquid nitrogen--that could be reasonably replicated in a normally appointed kitchen. In the end, she managed to create a dinner party featuring sous-vide salmon, rib steaks, caramelized squash, bloody mary celery sticks and balsamic panna cotta. It sounds delicious and very intriguing. Although I doubt I'd ever purchase Modernist Cuisine, I'd love to look through it some time. If Modernist Cuisine is your thing, you might also like the Times' story about Booker & Dax, a new East Village bar in the back of Momofuku Ssam Bar serving up chemistry-set-like cocktails. Verdict: The New York Times wins this round, since I've been quite curious about Modernist Cuisine, and their story allowed me a look into whether it could indeed include some practical applications. This month's GQ featured a kale salad recipe adapted from the Black Kale Salad served in Brooklyn's Five Leaves restaurant. The magazine described it as a clever take on a the classic Caesar and I was intrigued. Kale salad seems to be all the rage these days, at least judging from my limited sample (I also saw it on a menu in New York recently and my mom has been talking about it). And since I'm still in the post-holidays-need-to-be-good phase, creative dinner salads are perfect. I was a little apprehensive about the kale as the salad green. I tasted a bit of it and it was much tougher than lettuce. My mom reassured me that it would be good though, so I cut it into a fine chiffonade somewhere between 1/8- and 1/4-inch wide. 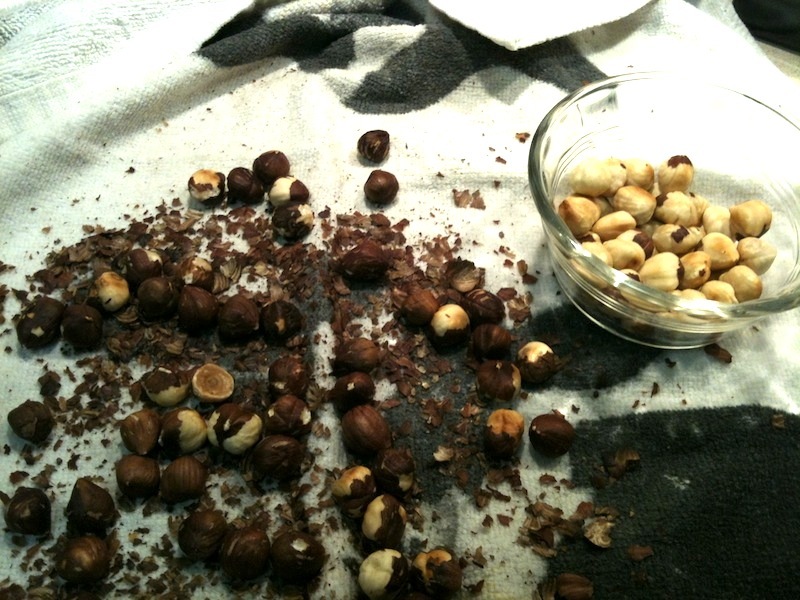 For the hazelnuts, after toasting them on the stove, I used the kitchen towel technique to remove their skins, which actually worked, for the most part--the skins came off about half the nuts. I used the skinless ones for the salad and saved the rest for later. I was excited the recipe called for aged Gouda, which is an amazing cheese. It doesn't taste much like gouda, more like an earthier Parmigiano-Reggiano. It's a hard cheese with that intriguing crystallized texture you get with good Parmesan. Although the recipe called for bacon, which I'm sure would be very delicious here, I substituted sauteed chicken to make it a healthier main-dish salad. To compensate for the lack of smokiness, I spiced the chicken with smoked paprika. One issue I had with the GQ recipe was that it made a pint of dressing, which is way, way too much. That's like a big dinner party worth of dressing or a week of Ceasar salads for two. So I cut it down to about 1/6 of the original amount, omitting the lime, egg yolks (not doing raw eggs) and anchovy, for which I compensated with a bit more Worcestershire. Since I was making a smaller volume, I heated the milk and garlic in the microwave instead of in a pan. This took a bit of trial and error, as I boiled it over when I set the heat to 50 percent. I think about 20 percent for a minute would probably do it. I used the opposite end of a cocktail muddler to mash the garlic and milk into a paste. I also used smoked sea salt for this, but you could use regular. Lastly, for anyone who thinks it odd that I'm touting a recipe from GQ, the magazine has quite good food writing. It was nominated for last year's James Beard Award for Food Section of a General Interest Publication, along with the winner, The San Francisco Chronicle, and The Washington Post. 1. 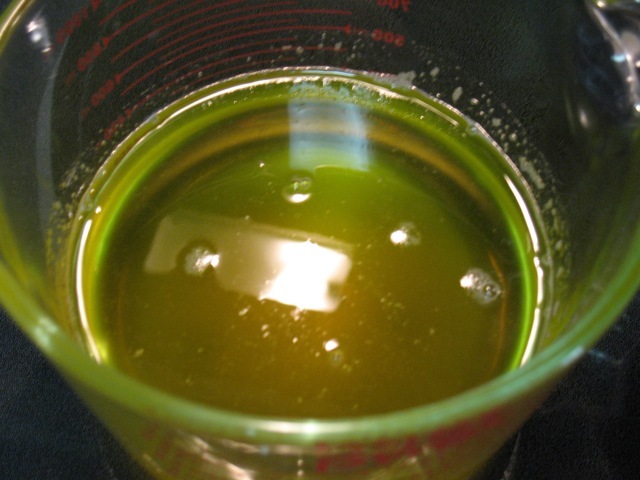 Heat 2 tbsp olive oil in a medium (10-inch) stainless steel pan over medium heat. 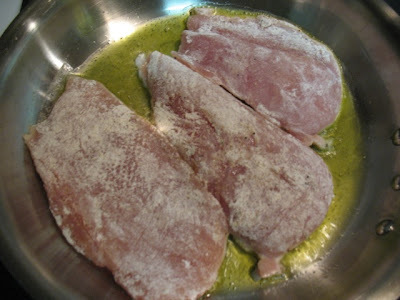 Pat chicken dry and add to pan when oil is hot (chicken should sizzle). Season with smoked paprika, seasoned salt and fresh-ground black pepper to taste, cooking for about 10 minutes, turning halfway. Remove chicken from pan and set aside to cool. 2. Toast hazelnuts in a small (8-inch) pan over medium-low heat, tossing occasionally. When fragrant, remove from pan and wrap with a clean dish towel. After about a minute, rub the nuts through the towel to remove nuts' skins. Set nuts aside to cool. 3. 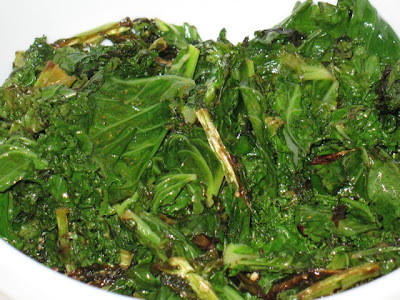 Slice kale leaves to remove tough inner stems. 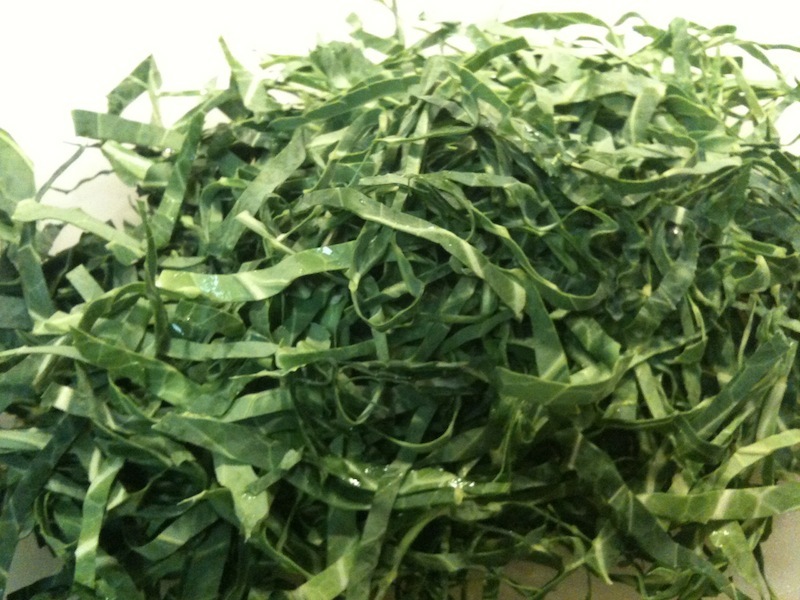 Stack leaves and cut in thin strips, about 1/8- to 1/4-inch wide. 4. 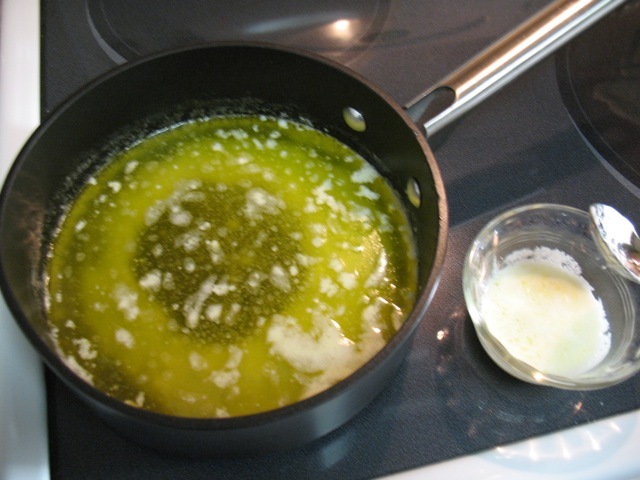 To make dressing, combine minced garlic and milk in a small bowl and microwave at a medium-low setting until the garlic is soft and fragrant, about a minute. Mash to a paste. 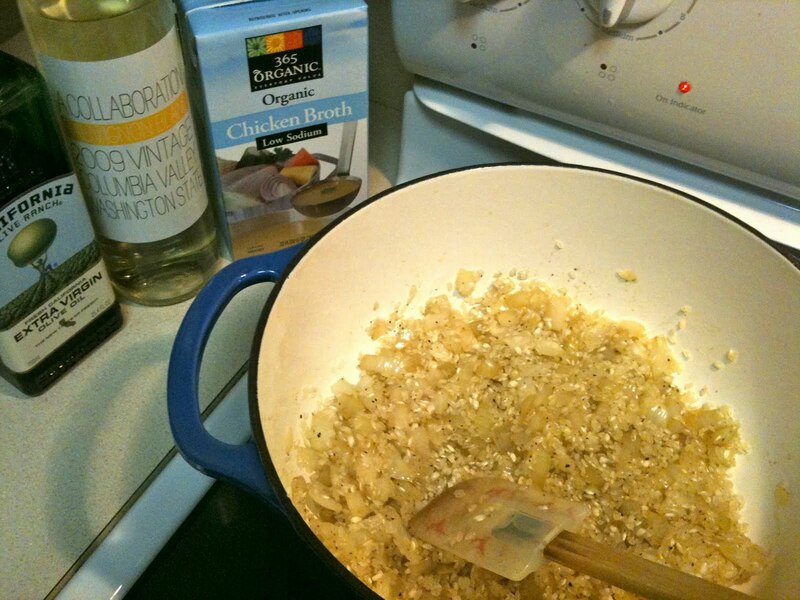 Add lemon juice and zest, vinegar, Worcestershire sauce and 1/4 cup olive oil. Season with salt and pepper to taste. Whisk until well combined. 5. 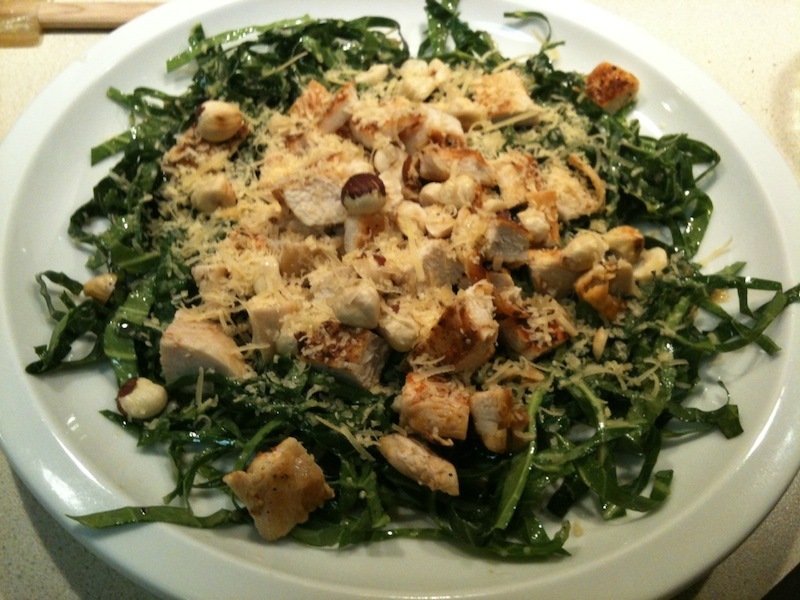 Toss kale with dressing and serve topped with chicken, nuts and cheese. To say that D.C.'s restaurant scene is booming is an understatement. In recent years, the city has become a culinary destination to rival the country's other great eating cities, and new places seem to open constantly. Last year's list of notable new restaurants includes Graffiato, Fiola, Rogue 24, Little Serow, District of Pi, Jack Rose, Hill Country, Lincoln, Elisir, Hamilton, ShopHouse, Bobby's Burger Palace, Shake Shack, Burger Tap & Shake (enough with burger places!). There's no reason to believe 2012 will be any less hot, with the recession in, um, recession (hopefully), new restaurant ventures could even accelerate. Here's a list of some of the more interesting new places slated to open this year. Range - Fall (Friendship Heights). Bryan Voltaggio, Top Chef alum and renowned chef and co-owner of the Frederick, Md., restaurant Volt will open his first DC establishment this year. Range has been described as a cross between a bistro and a steakhouse. It will be located in the upper level of the Chevy Chase Pavilion, the Friendship Heights shopping complex that is home to World Market and the Cheesecake Factory. Bandolero - Early 2012 (Georgetown). Mike Isabella scored a slam-dunk with his super-popular and tasty Italian-inspired Penn Quarter restaurant, Graffiato. For his next trick, he's tackling Mexican cuisine in the M Street space formerly occupied by Hook. Will be interesting to see whether it resembles his former boss's own Mexican establishment, Oyamel. Wagamama - Spring (Penn Quarter). Several years ago Wagamama promised to bring its tasty selection of Japanese noodles dishes to D.C. when it took over the spot vacated by Olsson's Books in Penn Quarter. A "coming in 2010" sign went up...and then 2010 came and went. Well in the 2011 the sign remained unchanged, the exciting teaser turning into a slap for the chain's fans (me included). Things turned around late in the year though, as a new "coming in early 2012" sign went up. Apparently, the project is back on. Rejoice! Daikaya - (Penn Quarter). As if one new Japanese noodle bar in Penn Quarter, there is a second. Daikaya will serve ramen on its lower floor and a broader Japanese menu upstairs. Although reportedly opening in February, judging from the (lack of) construction progress in the vacant site next to Graffiato, I think it will be much later in the year. Fuel Pizza - January (Penn Quarter and Downtown). North Carolina-based chain Fuel Pizza picked D.C. for its first locations north of its home state. The K Street location is set to open this week, with the Penn Quarter outpost at 6th & E to follow soon after. This dish is a slight modification of this week's Risotto with Parsnips and Green recipe from the New York Times that I was excited about Wednesday. It didn't disappoint, delivering a nice mix of flavors from the sweetness of the parsnips and the bitter kale. 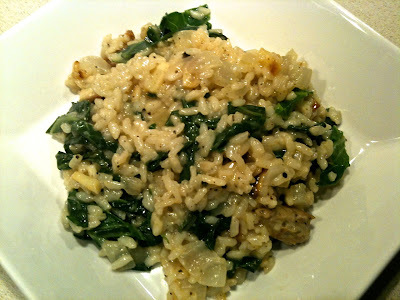 I find the tricky thing with risotto is getting the texture just right. Cook it too fast and the rice will be tough. Cook it too long and you end up with a gooey, squishy mess. The texture of this risotto turned out perfectly, the grains al dente with starchy-tangy creaminess lightly enveloping them. I used a dutch oven to cook the rice. In my experience, dutch ovens cook hotter than other pans, so I reduced the recipe's cooking temperature. First quibble with the recipe as written is the cooking time, which I find that recipes often under estimate. It says "about 40 minutes," which is not enough time. Working as efficiently as possible, this took me an hour. 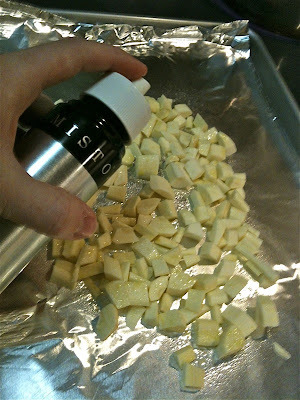 To help with timing, start by preheating the oven and then prepping the parsnips for roasting. Then, while you're waiting for the oven to heat up, boil the water and prep the kale. Don't worry if the parsnips look a little burnt around the edges (as shown below). They tasted great and even the photo with the NYT recipe showed them like that. Second quibble is that the recipe says to cook the kale in the boiling water "very briefly." What does that mean? I decided it was going to be enough time for me to stir the kale once, get the colander out the cupboard and put it in the sink and stir the kale again before draining it. That seemed to do the trick as it turned out great. The Italian sausage I added provided a nice meaty element, complimenting the other vegetables, as well as tying the dish to my spinach-fennel salad (since Italian sausage has fennel seed). I added the sausage at the beginning of the step to sauté the sage and garlic. I drained off most of the rendered sausage fat, but since there was still some fat in the pan, I omitted the 1 tablespoon of olive oil from step four. I kept the butter though, since that's an important flavor in the dish. To serve with this, I prepared a simple salad of baby spinach and fennel with a lemon-honey dressing. 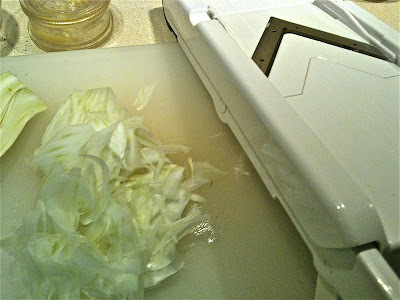 I used a mandolin on the lowest setting (1/16-inch) to thinly slice the fennel bulb. For the dressing, I combined lemon juice with honey, dried thyme, salt, pepper and extra-virgin olive oil. 1. Heat oven to 400 degrees. Peel the parsnips, quarter them lengthwise, and remove the tough core with a paring knife. 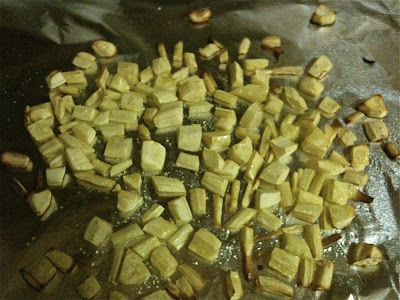 Cut into 1/2-inch random shapes, put in a roasting pan, season with salt and coat with 2 teaspoons of olive oil. Roast until tender and lightly browned, about 15 to 20 minutes. Remove from the oven and set aside. 2. Bring a pot of salted water to a boil over high heat. Remove the stems from the kale and cut it into 1/2-inch-wide ribbons. Cook kale very briefly in the boiling water (about 1 minute). Drain, cool and squeeze dry. Set aside. 3. Heat 2 tablespoons olive oil in a dutch oven over medium heat. 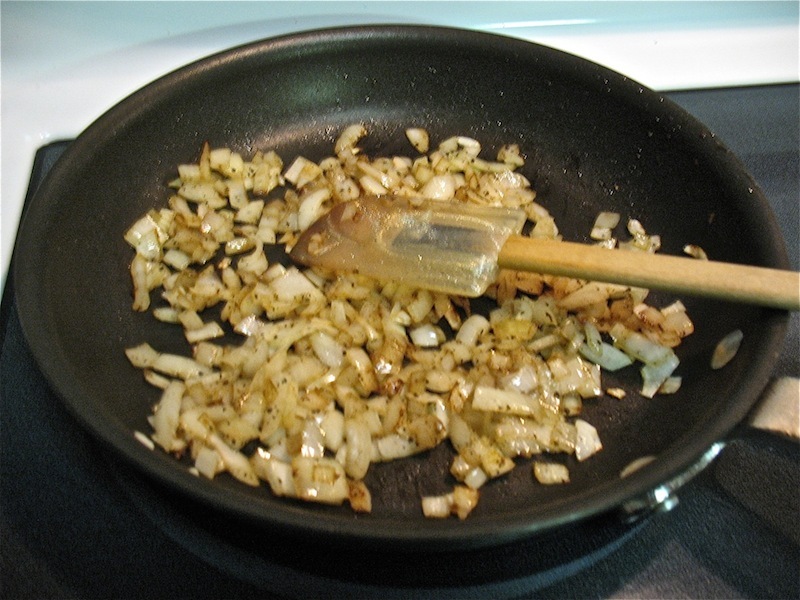 Add the onion, season with salt and pepper, and cook until softened, about 5 minutes. Add the rice and stir together with the onions until the onions are beginning to brown, about 2 minutes. Add the white wine and cook until it evaporates (doesn't take very long). Add 2 cups broth and reduce the heat just slightly to a brisk simmer. Cook for 5 to 6 minutes, stirring well every minute or so. When the broth is absorbed, add another 1 cup of broth and continue to cook for another 5 minutes. Stir in the last cup of broth and cook for another 5 minutes, until the rice is cooked, but the grains are still firm. Taste and adjust the seasoning, adding another splash of broth if necessary. Turn off the heat. 4. While the rice is cooking, brown sausage in a large frying pan over medium heat, breaking up with a wooden spoon as it cooks. When the sausage is browned, add the butter, garlic and sage and let sizzle without browning, about 1 minute. Add the roasted parsnips and chopped greens, season lightly with salt and pepper, and stir to coat and heat through, about 2 minutes more. 5. 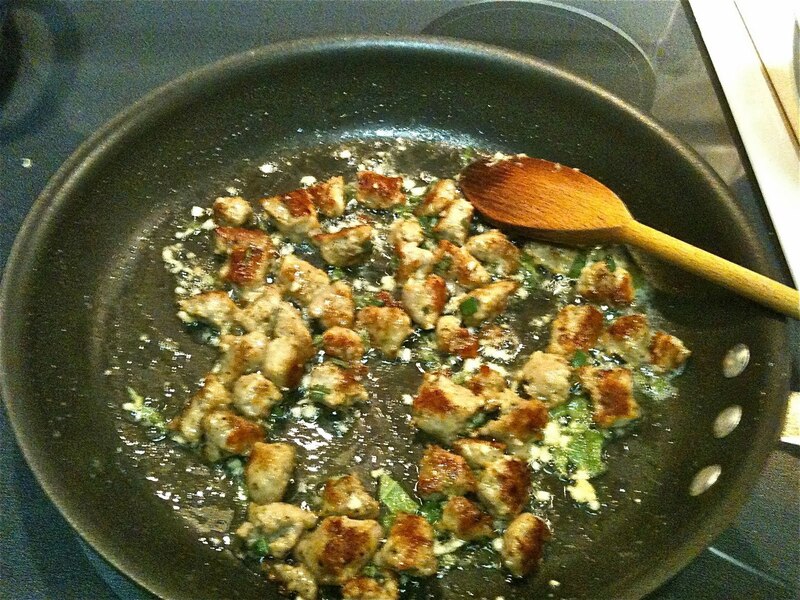 Gently fold the cooked sausage and vegetables into the rice with the parmesan cheese and serve. 1. 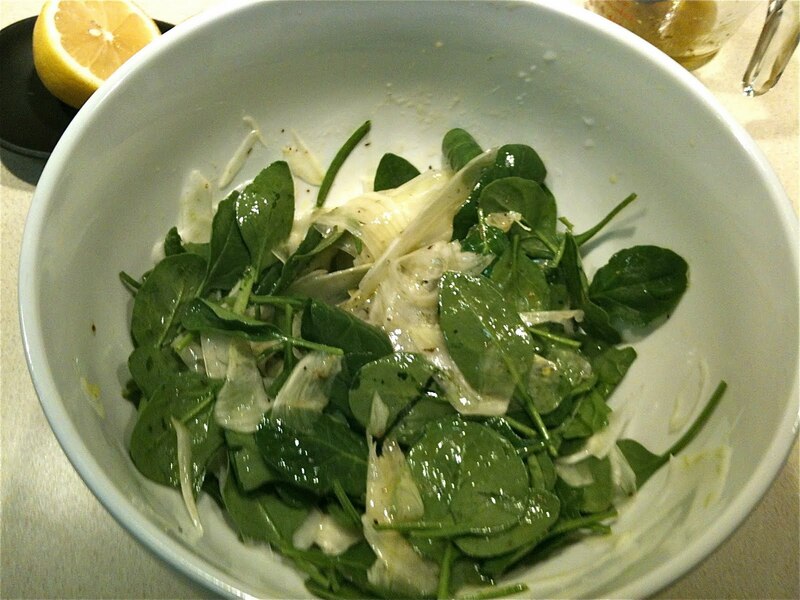 Combine spinach and fennel in a salad bowl. 2. Whisk together remaining ingredients and toss with vegetables.